rotation. Great breakaway forces due to ultra-low design. The ROTOTOP® allows any attachment tool mounted on to excavators and forestry equipment to be rotated limitlessly (360°). Many of its design characteristics are unique on the market. Our ROTOTOP® has been on the road to success in Germany and abroad for more than 10 years and proves its performance power on a daily basis. This innovative rotary drive takes up a top position in the domain of excavator rotary drives - not only as far as its weight and low construction height are concerned. The ROTOTOP® allows you to realise profitable saving potentials and pays off practically in no time due to its versatility. This will improve your competitiveness. Bank on brand quality: Made in Germany! The ROTOTOP® series comprises of six high-performance models. Our rotator can be mounted to excavators ranging from 0.8 - 35 t from all common excavator classes. In connection with the respective excavator's bucket kinematics, all attachment tools on all excavators and forestry equipment may be moved in any operating position imaginable. This extends the operating range and reduces time-consuming and expensive manual work with nearly all operations. You work considerably more effectively with the backhoe and save immensely on the costs, since each attachment tool must no longer be purchased with its own rotary drive. In this way, our ROTOTOP® pays off in many ways with most of our customers. By purchasing our ROTOTOP®, investing in individual rotators for your various attachment tools becomes obsolete. The ROTOTOP® - superior technology – for excavator classes with an operating weight ranging from 0.8t – 35t. 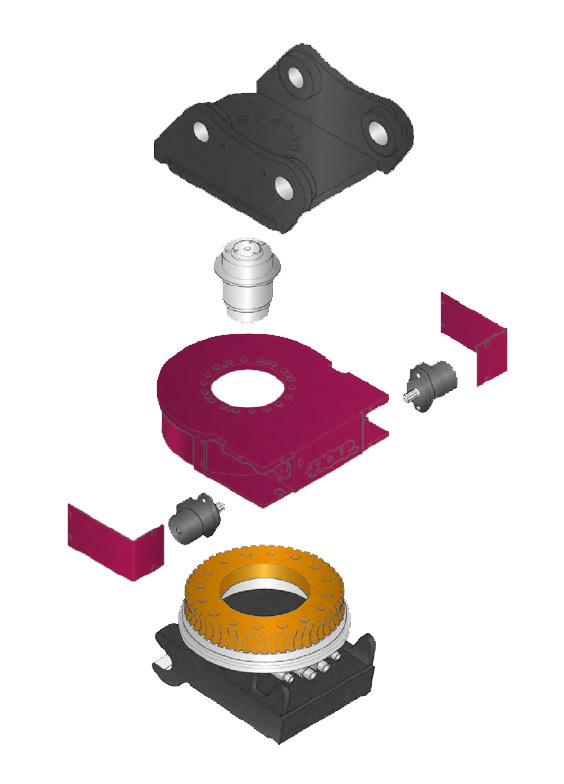 The ROTOTOP®'s design is that of a modular system. Components, such as swivel joints, which are initially not required, may be retrofitted at a later point. 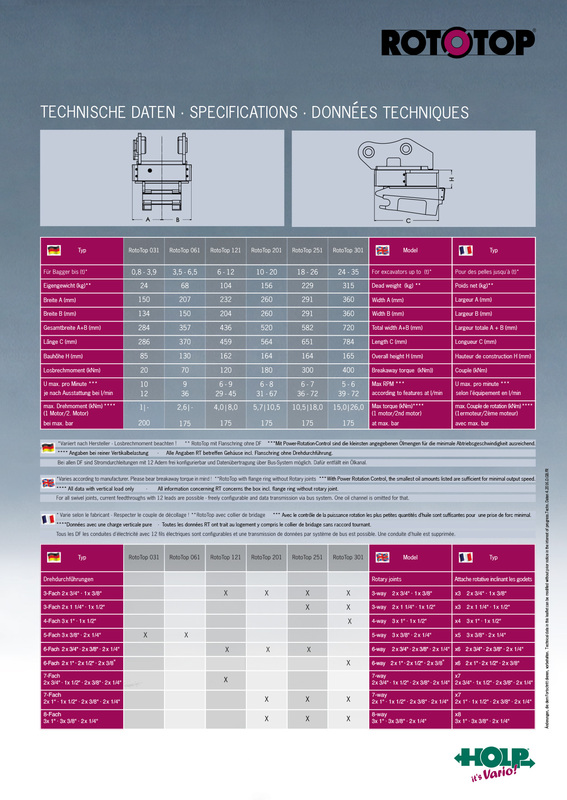 Our standard programme featuring 10 different swivel joints meets even the highest of requirements. Additionally, this provides the possibility to equip all fully hydraulic systems also with the full 5 hydraulic hoses. 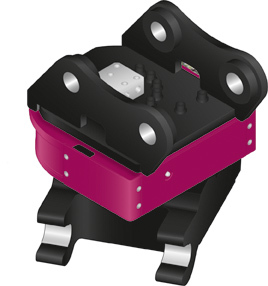 This allows to even connect fully hydraulic quick-couplers in their original setup and to supply them with electricity as well. In order to achieve even more rotary power, you have the possibility with the models RT 121/201/251/301 to build in a second hydraulic motor. Of course retrofittable. Swivel joints equipped with up to 7 pipes allow the ROTOTOP® to be used with the most diverse attachment tools. The excavator's complete system pressure (up to 400 bar) may be transmitted to the attachment tool. This is possible with diameters even larger than 1 inch. In this way, large quantities of oil can be delivered to the attachment tool. In addition, through each swivel joint electrical current can be conducted. By means of the current feedthrough, the ROTOTOP® provides the possibility for using 2D or 3D controls as well as tool recognition. As our ROTOTOP® is equipped with an extremely shockproof slide bearing,as well as a worm gear, any slip or turn of the attachment tool is rendered impossible. For those who would like to swap the ROTOTOP® among excavators, the rotator can also be ordered as a sandwich design (with quick-couplers at the top + bottom). Often requested, however proves inefficient in most cases as the operator cannot get used to their "wrist” on the excavator. Switch Valve - Simply Switch, It Saves You Cash! If several excavators in a company's machinery are equipped with a fully hydraulic quick-coupler as, for example, the OilQuick, all attachment tools with and without drive (shuttle hooks, special pipe grabs with rotators) can be easily exchanged amongst the excavators with ROTOTOP® and those without ROTOTOP®. The switch valve solves logistics problems on the construction site, because all excavators can swap their attachment tools without any problems. If you ship one of your intact tools to us, you can bolt your rotary quick-coupler on to your excavator in our workshop following only a short retrofitting time of a few days. Then simply adjust a few hydraulic hoses and you can go back to work at full speed. This helps with the cost-saving! 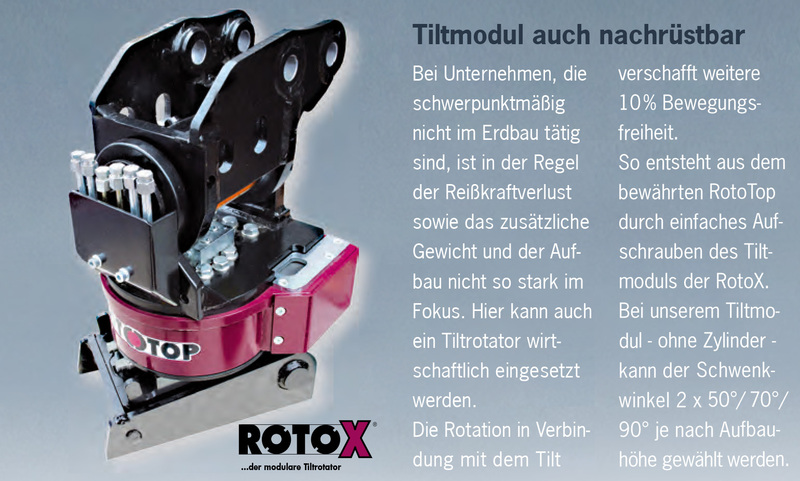 Our ROTOTOP® is similarly powerful and flexible as a tilt rotator. Our ROTOTOP® is versatile and not only brings about many benefits, but also brings back the fun to work, irrespective of whether it is pit excavations, back-filling and compacting of lateral work spaces, demolitions, sewer construction when gardening and landscaping or roadmaking. Its 360°-rotation makes precise contours a possibility when working. Quick and flexible during operations on digging profiles owing to the excavator’s central position on the grounds. Quick distribution of material by rotating the bucket and precise filling close to boundaries. Work perfectly with the rotation movements when skirting obstacles and boundaries, as well as time savings due to significantly fewer positional changes of the excavator. For tunnel works, sewer construction and demolition works, it may actually make sense to operate rotary cutters under the quick-coupler as well as directly mounted with a 15°- 20° angle of attack. This ensures that you can cut the profiles and contours required in operations in practice. Well-known manufacturers such as Atlas/ Schaeff/ Terex/ Rokla/ Simex/ Webster have confidence in the ROTOTOP®’s durability. During operations with a hydraulic hammer, one usually works with an angle of attack of 10°. This ensures that one can chip off, e.g. In a sewer trench, at an angle of 90° to the boom. 3-years warranty "without annual time limit” on all of the above-mentioned attachment toolsUp to a total of 3,000 operating hours..